A record number of calls were made to the National Debt Helpline in February this year. A RECORD number of cash-strapped Australians are turning to free financial help to dig themselves out of soaring debts and mounting bills. Alarming new statistics show the National Debt Helpline - a free and independent telephone service used to help struggling Australians - received its highest ever number of calls last month, totalling more than 18,000. This is a 12 per cent climb compared to February last year and surpassed the previous monthly record number of calls in March 2017 of 17,000. Many Australians have struggled with overspending at Christmas, the burden of school fee payments at the start of the year and soaring cost of living expenses. Financial Counselling Australia's chief executive officer Fiona Guthrie said the recent financial services Royal Commission had highlighted to Australians they have rights and can get help. "It showed not all financial institutions are doing the right thing and it's not the customer's fault," she said. "The start of the year is always a busy time of the year for us because children go back to school and people also start to think about their financial position." 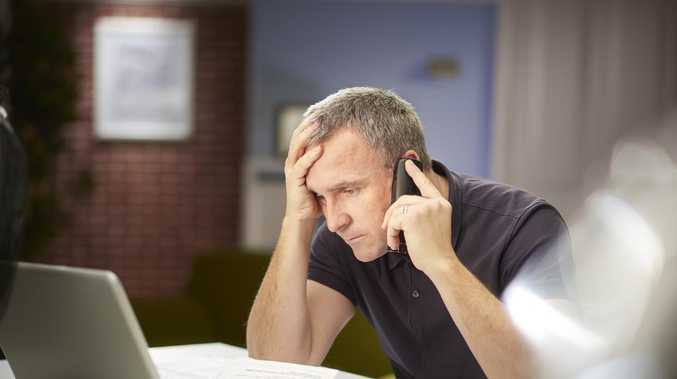 An increasing number of Australians are turning to get free help from financial counsellors. The National Debt Helpline is a not-for-profit service that started in 2011 and has qualified financial counsellors available to help those struggling better manage their debt and improve their monetary position. Ms Guthrie urged Australians in financial trouble to seek help as early possible before their situation worsened. "We've had more than one million calls to the financial debt helpline so if you have financial difficulty don't let it eat away at you," she said. Many credit card customers remain crippled with plastic debts - latest Reserve Bank of Australia figures showed Australians owed more than $50.5 billion and $31.7 billion is accruing interest. Rising Tide Financial Services' managing director Chris Browne urged Australians to "live with their means" and avoid spending more than they earn. "This advice is ignored by some people mainly due to the ease of tap and go payments and credit cards," he said. "Sadly this can lead to unpleasant stress levels and in some cases relationship breakdown." He suggested those struggling with credit card debt to stop using their cards and consolidate their debts to help get back in the black. Financial institutions, utility and telco companies are among many service providers who provide assistance to customers if they are struggling to meet their repayments. This includes being put on payment plans. People struggling with their finances are urged to call the National Debt Helpline on 1800 007 007. Life Veterans march through the streets alongside younger students. Your Story Daughter of Marcia Hines isn't living in anyone's shadow. Community Photos from the Anzac Day march in 2019.